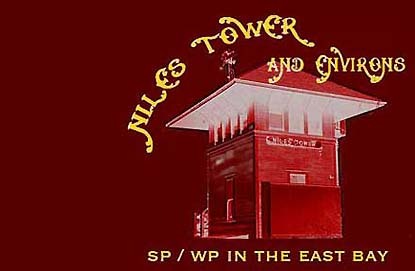 Near the end: Niles Tower on April 30, 1983 Though the nation was far along in its advance out of the 1980 recession, SP was not. 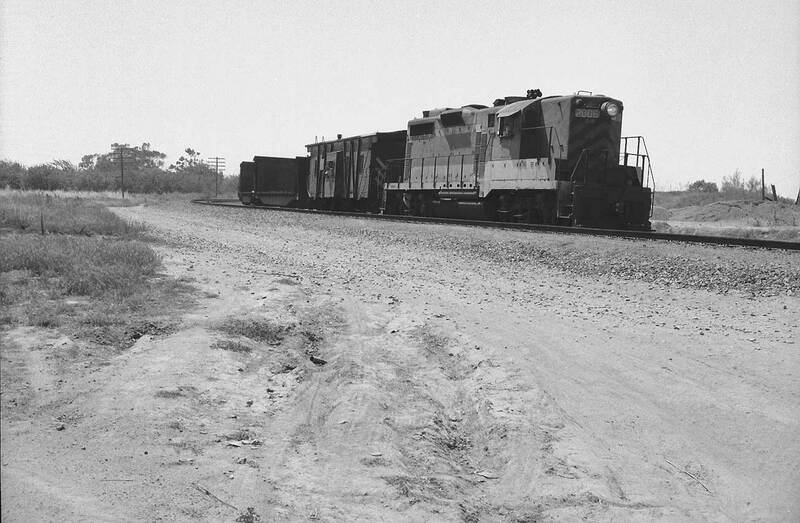 Its boxcar business had evaporated, never to return. 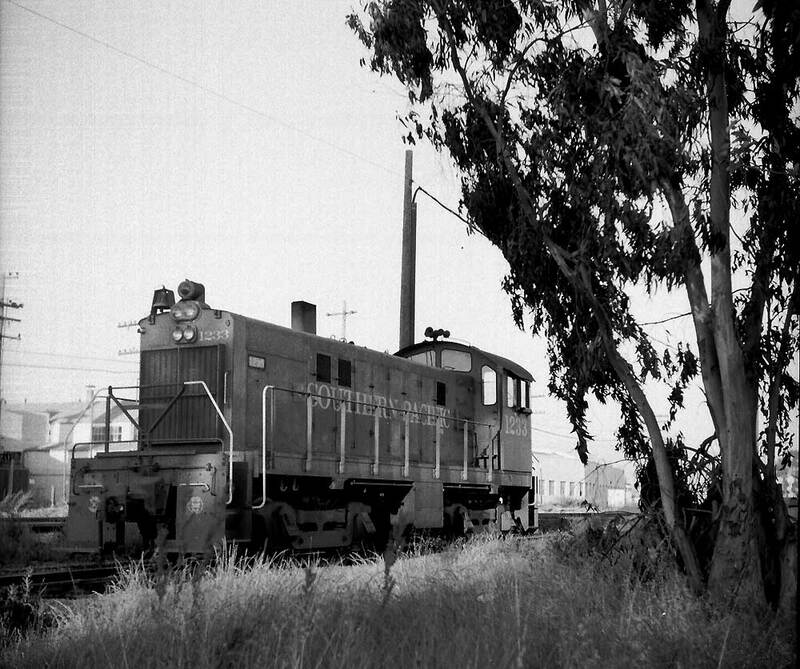 SP trains by Niles Tower were infrequent, compared with the past. Worse, WP had just plain evaporated the previous January. UP yellow was already beginning to predominate at the tower. By late June, sixty percent of the former WP locomotive roster was out of service, not that it made any difference to Wx4 staff on that Saturday morning: no UP trains. Thus, during our one hour visit with Cookie, the tower's UP operator, the only train that we saw was SP's East Pleasanton turn. 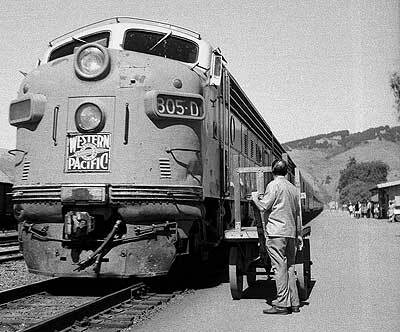 Bay Area railfanning was slim pickens during the recession. 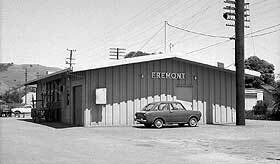 Further down the page, you will find the "and Envirions": WP in Fremont and a couple of looks at Niles Canyon, plus Wx4 Bonus Photos of Newark. Right: In her last years, Niles Tower assumed an ever more somber, brooding appearance, unpainted for decades. Here, while the typical East Bay morning overcast is lifting over in the canyon, the tower still sits immersed in gloom, almost as if she was contemplating past glories and the fate that would soon befall her. 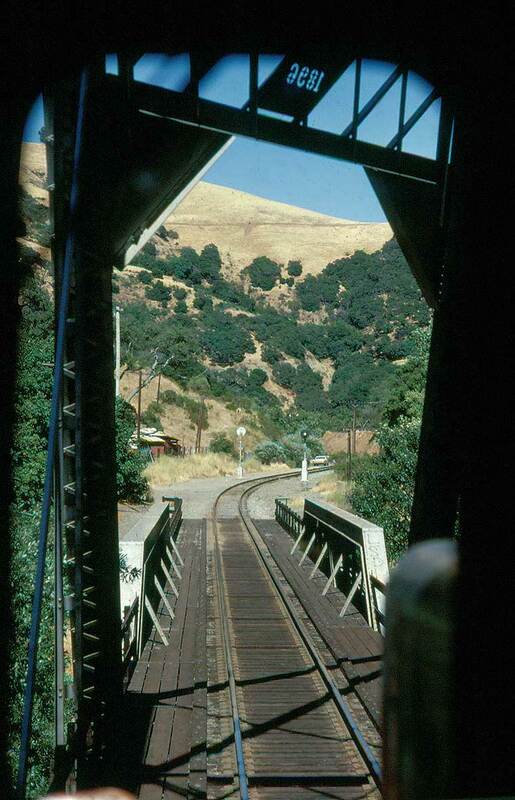 Above & upper right: This being a Saturday, the East Pleasanton Turn did not operate to East Pleasanton. 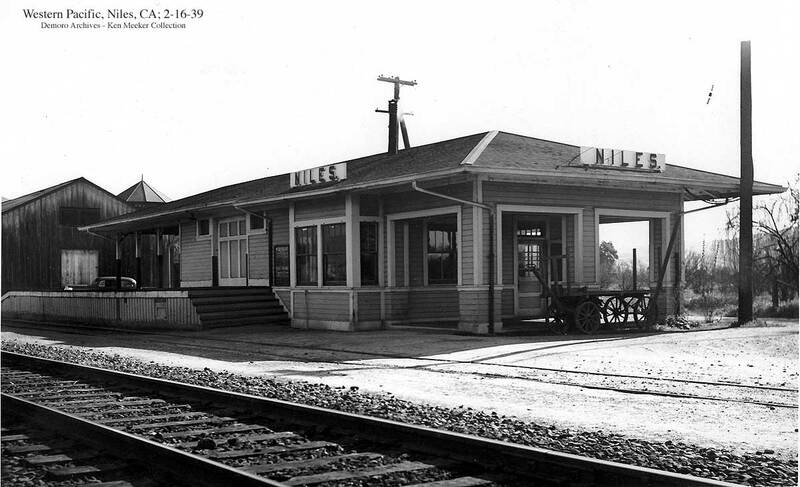 Rather, it headed up the Milpitas line from San Jose to Niles Tower, then backed up to the Centerville Wye and headed towards Newark through the east leg's hand-throw switches. Eventually, the train headed back to San Jose via Agnew. In former years, before SP closed the Dumbarton Bridge, this train operated out of Bayshore Yard and mainly carried rock from three quarries at East Pleasanton/Elliot. 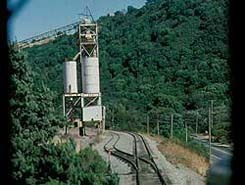 It also made occasional runs to the steel mill in Livermore and out the San Ramon Valley branch after the East Pleasanton switcher job was annulled. 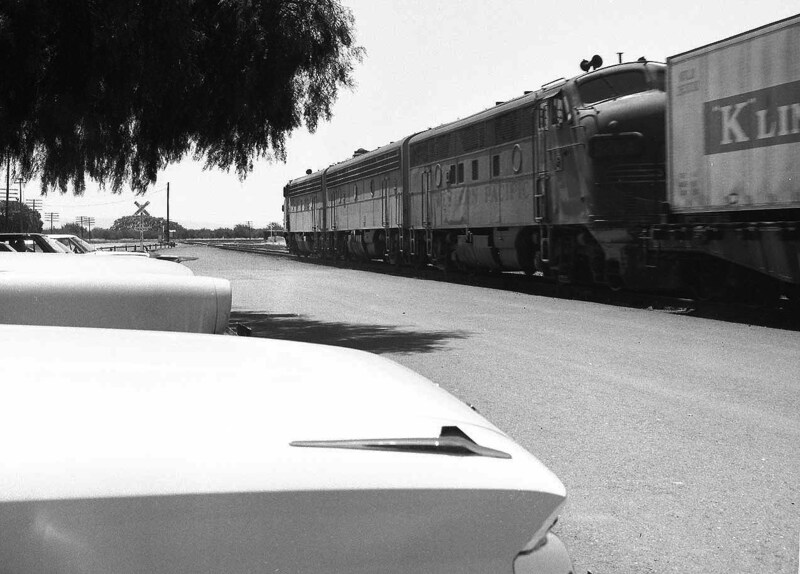 In the late 1970's, the Turn's arrival at its namesake often coincided with the passage of the F-units on WP's San Jose Autos. The "EPT" was one of Wx4 staff's favorite runs. Anyone recognize the hoghead? 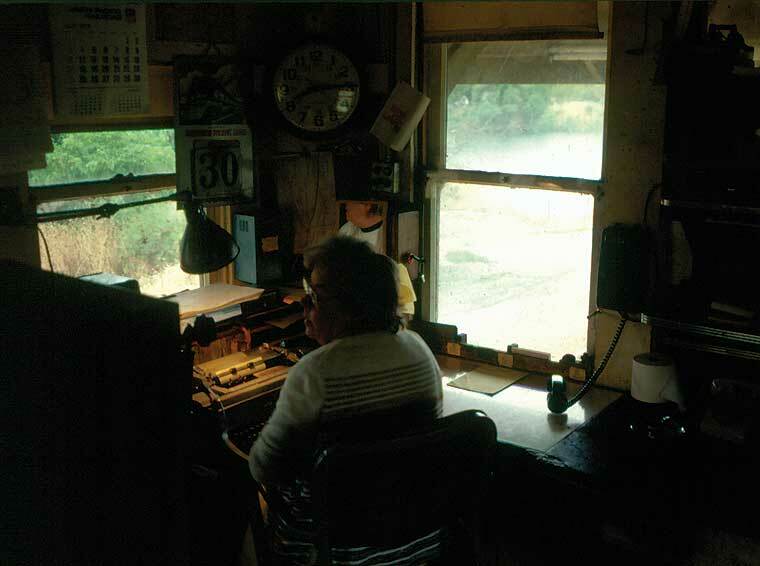 Above right: Cookie, the WP operator (and a genuinely nice gal), has a blank order in the Underwood, and is ready to "copy one". Notice the pre-WWII calendar featuring a slant-nose Missouri Pacific E-unit. 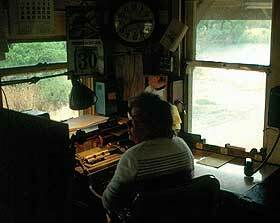 Also note the ancient dispatcher's-line phone, and the more modern (UP dispatcher?) phone off of the hook to avoid interruption. The interlocking machine at her left only controls SP switches. 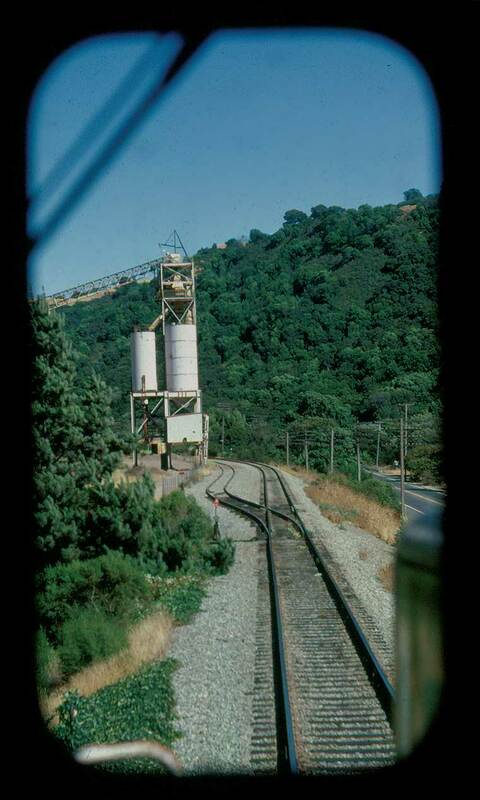 From the cab of an eastbound East Pleasanton Turn, Summer, 1979; Left: Brightside, now (2005) Niles Canyon Railway's headquarters; Right: Farwell bridge; Below: east leg of SP's Niles Junction wye. Note the signals visible (barely) in the right windshield. 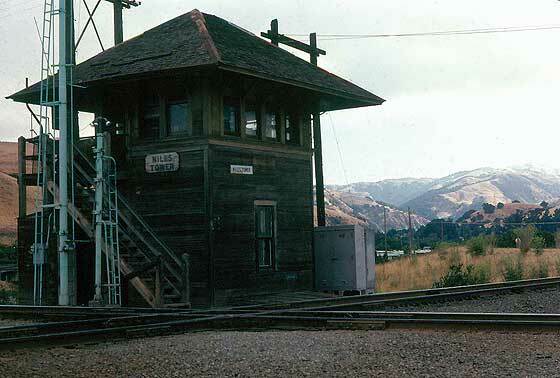 It was a short block between the junction switch and the last intermediate signal up the canyon east of the wye switch. 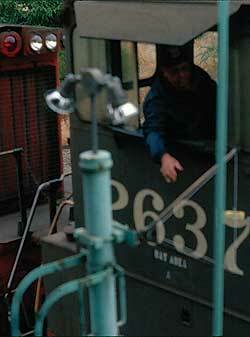 Plus, the wye signal was on a blind curve, and would sneak up on you. If an engineer didn't already have a good hold on a heavy train when he first saw that intermediate displaying approach, he could easily slide by the junction signal. Many new engineers did. Now it should become obvious why you don't see many (any?) 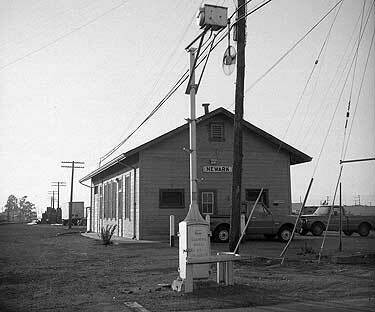 pictures of WP's second Fremont/Niles depot. That little Hillman (above) is one heck of a bunch more interesting than the tin monstrosity behind it, yes? 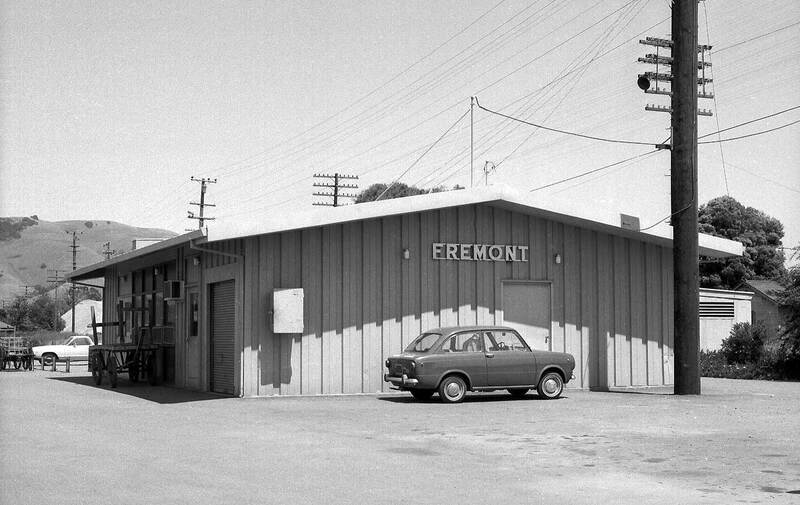 In truthfulness, WP's original Fremont/Niles depot, which was demolished in favor of the tin shed in 1963, wasn't much better looking, as far as we are concerned - it looks very similar to WP's surviving Irvington depot, which was uprooted and deposited on the hillside above downtown Niles in the 1955. 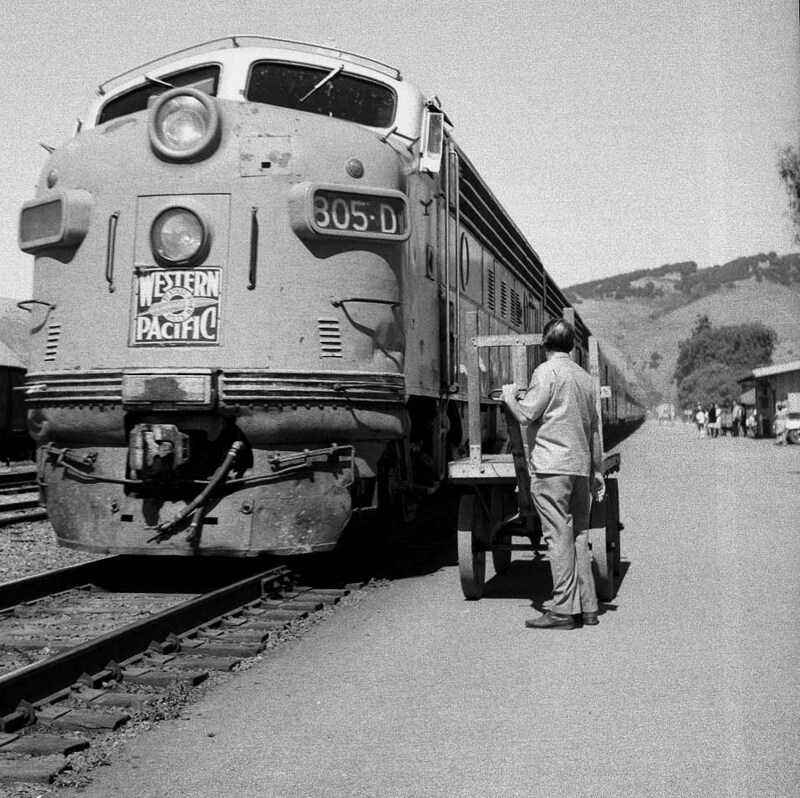 Fremont depot's saving grace was that the California Zephyr used to call upon it twice a day, The photos left and below show the Zephyr's arrival and departure on a positively wonderful day in June, 1969 (the other pics come from that day, as well). 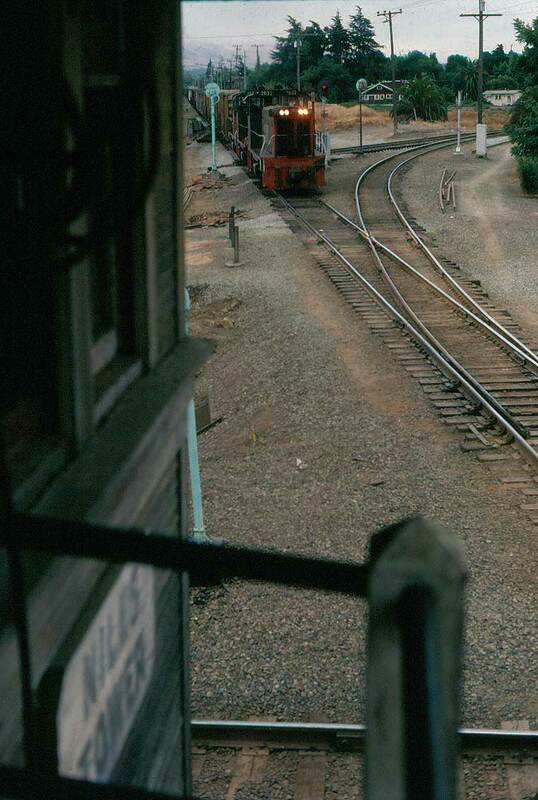 The lower view was taken at the great curve just west of Fremont Yard. That's Pacific States Steel, which operated from 1938 to 1978, on the left. The photo second below, featuring GP20 # 2006, shows the curve looking the other direction. Third below, is the curve from the depot parking lot. The crossbucks protect the interchange track that connects with SP's Shinn siding. Note the passenger F3 on the freighter still retains its nose wings, while the 805-D is missing hers. So, would you say that Newark, which is about five miles down the Centerville Main, is in the vicinity of Niles Tower, thereby qualifying for this page? Such existential problems can be a bugger. Webster's defines a vicinity as a "neighborhood", which is an equally vague term. Now, when some old fuddyduddy in Niles complains about "those darn neighborhood kids", he's not whining about miscreants from Newark, is he? But on the other hand, in our way of thinking, Greenland is in the vicinity of the North Pole, and Tom Cruise is in the neighborhood of whack-o. So, if Tom Cruise starts creating problems at the North Pole, is some octogenarian Esquimo down in Thule, Greenland going to lament that "the neighborhood is going to hell?" We don't know, so we've labeled the above Spring, 1971 shots as "bonus photos", figuring that, at the Piggly Wiggly, you get a bonus coupons for Pringles on the back of your receipt for organic cauliflower, so why should our bonus photos necessarily be closely connected to the topic at hand?